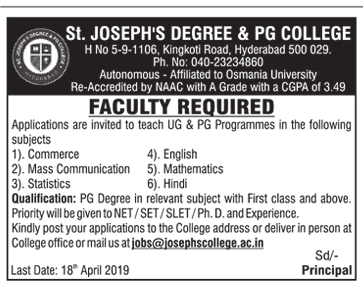 St.Joseph's Degree and PG College, Hyderabad has advertised in the DECCAN CHRONICLE newspaper for recruitment of Lecturers jobs vacancies. Interested and eligible job aspirants are requested to apply on or before 18th April 2019. Check out further more details below. About College: St. Joseph’s Degree and PG College, established in the year 1997 by the Hyderabad Archdiocese Educational Society, is a Co-education Catholic Christian Minority Institution. The college functions under His Grace Most Rev. Thumma Bala, Archbishop of Hyderabad. The college is centrally located in a 2-acre Wi-Fi campus with state-of-the-art infrastructure. It has emerged as one of the leading higher educational institutions. First class PG in concerned department. Ph.D / SET / NET / SLET candidates will be preferred. How to Apply: Interested candidates are requested to send their detailed application along with CV, copies of certificates and recent PP size photo to the email address or postal address provided below or submit in person to the college.